This dish serves 4-6 depending on the appetites you’re feeding and if you offer fresh fruit or toast or any other sides. 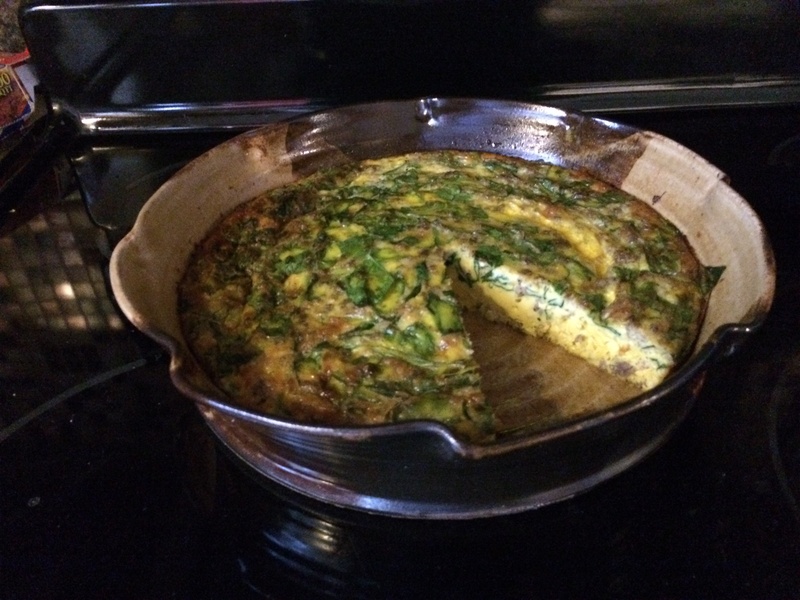 I am using our large baking dish that easily accommodates a dozen eggs. We also have a smaller baking dish available that is great for 6-8 eggs. Start by browning your breakfast sausage. I use one pound of Jimmy Dean All Natural Regular Pork Sausage because it is MSG free, nitrate/nitrite free, and phosphate free. (Plus it’s gluten free, which matters to some.) Yes, organic would be preferred, unfortunately that’s not in the budget this week. Brown Sausage in a small to medium pot on the stove. Be sure to drain off the fat or let the sausage rest on paper towel to absorb the grease. To be thrifty, put half of the browned sausage in a baggie and throw it in the freezer for later. 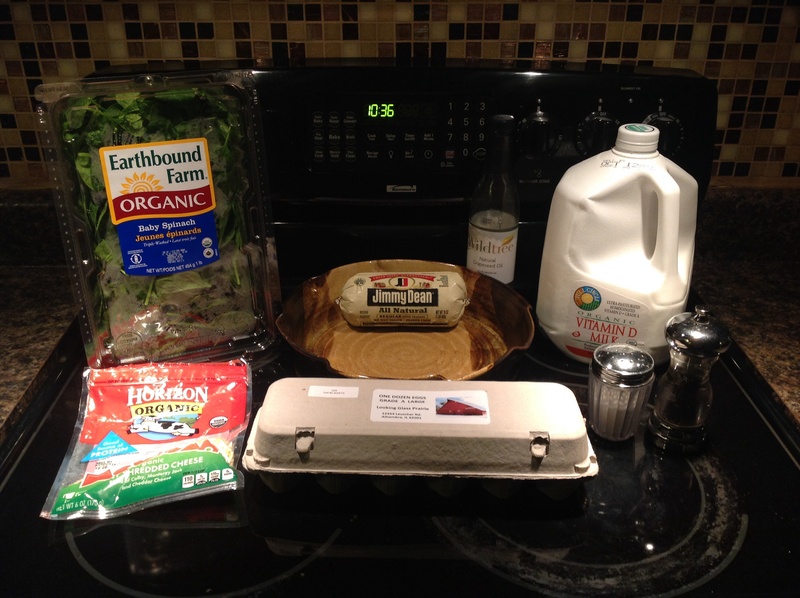 I get my eggs from a local farm on a weekly basis. Not only are they beautiful, but they have a deliciously rich flavor. I have found that 12 eggs is ideal for our family, but you can use 8-6 if you don’t need quite as much. Beat your eggs and add milk. I’m not big measuring, I just pour some in until it looks pretty good. Around 1/2 – 3/4 cup organic whole milk. After you beat the eggs and milk so they’re fluffy, toss in 1/4 cup-ish grated cheese. We change it up around here, which is mostly due to what I have on hand. Some days I use cheddar, other days it’s been mozzarella and parmesan. For a great kick add pepper jack cheese! Next add 1 1/2 cups torn baby spinach. If you’re cooking with the kids this is a fun thing for them to be doing. 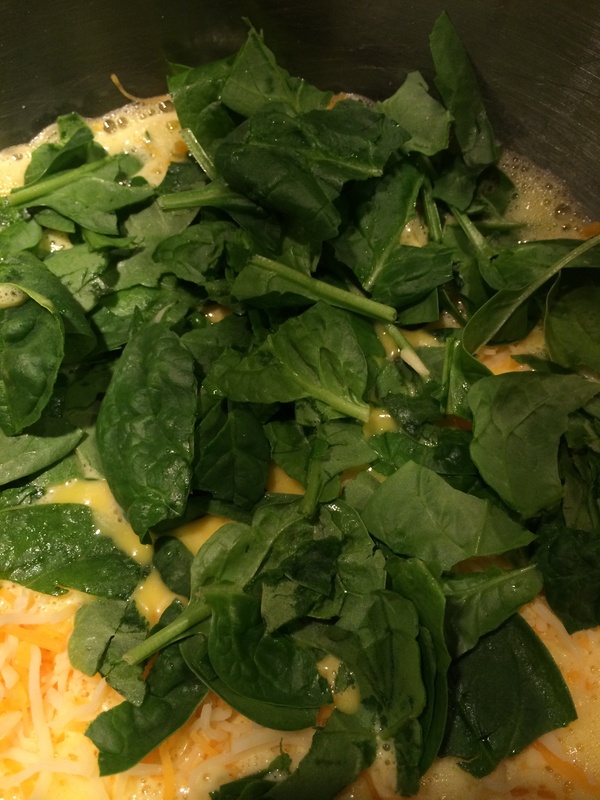 While you’re busy beating eggs your little helper can be tearing baby spinach leaves. It doesn’t have to be extra tiny or sliced or all the same size. Just let the kids grab a few leaves and rip them up a couple times. At any point you can add your sausage and salt and pepper to taste. Which, really is an odd thing to say. After all, who is going to add some salt and pepper to raw egg soup, stick their finger in and taste it. Really? Don’t do that. Just add some. and then add more after it bakes if it wasn’t enough. 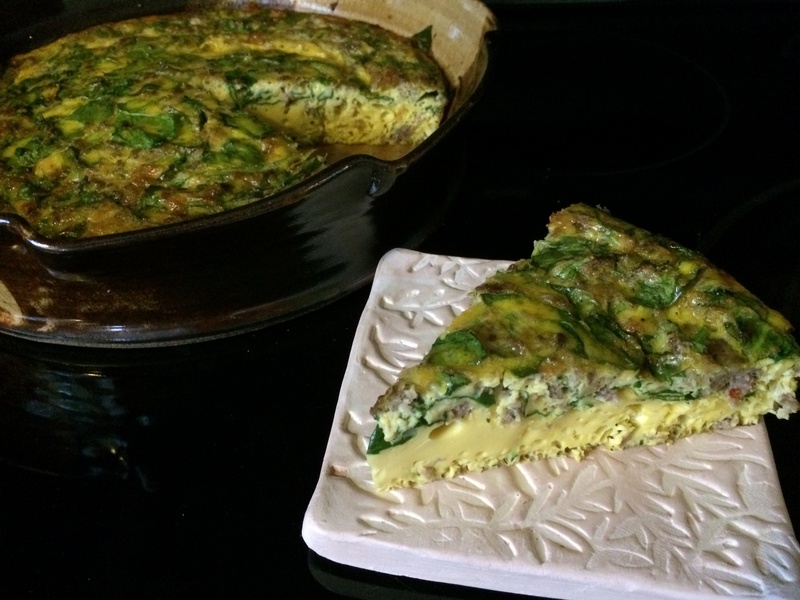 Before I pour my egg mixture into my baking dish, I spritz the dish with grapeseed oil. You could use Extra Virgin Olive Oil or Coconut Oil or even butter I suppose. I have made this several times before in a glass baking dish and in Corningware. ** If you are preparing this the night before and don’t want to bake it until the morning then you can cover your dish with plastic wrap and refrigerate it overnight. I bake mine in my convection oven at 350 for 40 minutes. I honestly don’t know if it takes longer to bake in a conventional oven. Just be sure that the egg in the middle is completely cooked before you serve and enjoy! ** Note about this bakeware: I have made this several times before in a glass baking dish and in Corningware. The eggs stuck to both of those dishes regardless of how well I oiled the pan. The casserole baked in the DowntoEarthenware Baking Dish was extremely easy to cut and came our without any of the egg sticking. Beautiful results!